The Met PGA HOPE initiative began at West Point Golf Course on Thursday, May 21, 2015 with 22 US military veterans and 9 Section Golf Professionals participating. 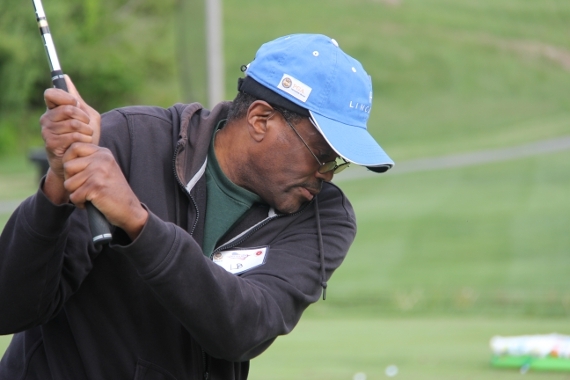 PGA HOPE is a program that utilizes the game of golf to help physically and cognitively disabled war veterans to lead a productive, active, and happy lifestyle in their post-service lives. The goal of the day was just to make them smile, and by the time the vets hopped out of a Hudson Valley VA bus and took in the rolling green hills that West Point Golf Course had to offer, the day was already won. A line of Golf Pros, some military vets themselves, stood to shake the participants’ hands and thank them for their service before taking them down to range and putting green to show them what golf was all about. Whether the veterans had played golf before or not, each one learned exactly what the sport is, a little about its history, and how to both putt and smash the ball at the range. Overall, it was a successful mission. Paul Glut, a former marine himself, Kregg Moyer, and Kevin Rodine took up position at the range and taught the vets in the ins and outs of striking the ball. Within 20 minutes, vets who had never so much as been to a golf course before were flying the ball down the fairway. Ronny, one of the vets, couldn’t contain his excitement when he launched his first beauty over a hundred yards. “Wow, did you see that? Wow!” was all he could muster. Down on the green, Bob Bigonette, Mike Turnesa, and Dave Carazo, who served his own 11 month tour in South Vietnam, cultivated the vets’ short game. After seeing a putting green for the first time, one veteran wondered if all golf courses had artificial grass. Once the friendly jeering had subsided, Carazo explained how the grass is cut, fed, kept alive, and how the different lengths affect the game. After that it was distance and aim control drills: putting uphill, downhill, through gates, and even playing around the world on one specific hole. And finally, Jim McCann, Jonathan Gold, and West Point’s own Andy Crane took the vets through the different aspects of the game of golf. Walking around the course the vets learned about how the game is played, some of the basic rules, how golf carts work, and got some factoids about the world of golf. It was an educational experience for the newbies and experienced golfers alike.